Like most Mil-Spec components, substantial information can be gleaned from the MS20257 part number. However, reading and interpreting MS20257 Hinge part numbers can be somewhat confusing. Here we aim to dispel some of this confusion, in a concise format. MS20257 part numbers always begin with the Base Number, “MS20257”. After the Base Number, things can get a little confusing. If an “H”, “X”, or “Y” follows the base number, the part is a Type H, X, or Y hinge half, and not a complete hinge assembly. If there is no “H,“, “X”, or “Y” after the Base Number, then the part is a complete hinge assembly. After the Base Number, but before the Dash Number, there will be a “-”, “P”, “C”, or nothing. A “-” indicates an Aluminum Hinge Assembly with No Finish, and a “P” indicates an Aluminum Hinge Assembly with an Anodized Finish. A “C” after the Base Number indicates a Stainless Steel hinge or hinge half, and no character present indicates the part is an Aluminum hinge half, with No Finish. The next digit is known as the Dash Number, which specifies the width, thickness, pin diameter, and other dimensions of the hinge. There are 6 options for the Dash Number- the numbers “1” through “6”. The 6 digits correspond to hinge widths of 0.750” (19.05mm), 1.062” (26.97mm), 1.250” (31.75mm), 1.500” (38.10mm), 2.000” (50.80mm), and 2.000” (50.80mm). Recall that other hinge characteristics in addition to width are dependent upon the Dash Number. For these additional characteristics, please see the MS20257 Specification, available here. A dash “-” always follows the Dash Number. Next, the length of the MS20257 hinge or hinge half is given in hundredths of an Inch. For example, a length of 4.50” (114.30mm) is specified as “450”. 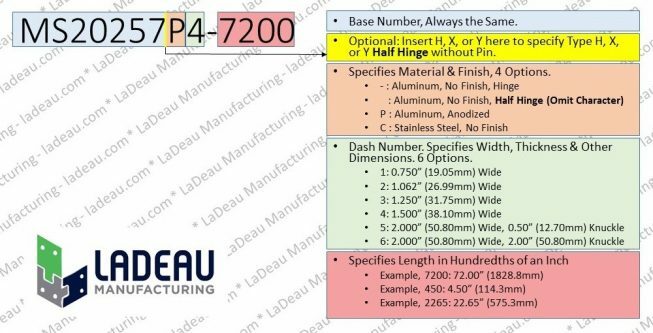 A length of 72.00” (1828.80mm) is specified as “7200”. A length of 120.00” (3048.00mm) is specified as “12000”. No decimals are used. MS20257-2-7200 is: Aluminum Hinge with No Finish, 1.062” (26.97mm) wide by 72.00” (1828.80mm) long. MS20257X4-350 is: Type X Aluminum Half Hinge with No Finish, 1.500” (38.10mm) wide by 3.50” (88.90mm) long. MS20257P6-4800 is: Anodized Aluminum Hinge, 2.000” (50.80mm) wide by 48.00” (1219.20mm) long. MS20257HC1-100 is: Type H Stainless Steel Hinge Half, 0.750” (19.05mm) wide by 1.00” (25.40mm) long. MS20257C4-9600 is: Stainless Steel Hinge, 1.500” (38.10mm) wide by 96.00” (2438.40mm) long. MS20257YP3-1325 is: Type Y Anodized Aluminum Hinge Half, 1.250” (31.75mm) wide by 13.25” (336.55mm) long.